Kim Kardashian had a dress alteration drama just hours before hitting the red carpet at last night’s Met Ball in New York. The reality TV personality, who arrived at the star-studded fashion gala on the arm of rapper boyfriend Kanye West, decided to wear her gown at the last minute after the original version of the style didn’t fit her pregnant figure. Kim made her debut appearance at the Costume Institute Gala wearing an unusual floral print dress, which completely covered her arms and hands, and featured a high neckline and a thigh-high split. The style, which was reportedly altered a total of five times to fit the expectant mum, was created by Givenchy designer Riccardo Tisci, who was co-hosting the event and is also a close friend of Kanye. The insider also said that the stylist removed a belt structure that was making her look fuller, and that her rapper partner was annoyed because the team kept tinkering with a ‘beautiful piece of art’. After last year’s Met Ball snub, it’s understood that the mum-to-be was allowed to attend this year’s event, the biggest in the fashion calendar, on the grounds that Kanye was performing. 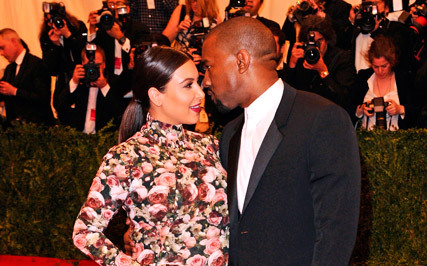 What do you think of Kim Kardashian’s Met Ball look? Tell us your thoughts in the comments box below!